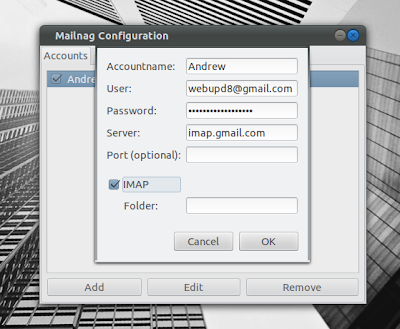 Mailnag is an email notifier for GNOME 3. 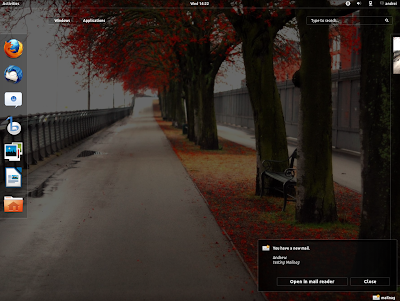 The application makes use of the GNOME 3 notifications system and works with both POP3 and IMAP servers (this includes Gmail). Once installed, launch the Mailnag Configuration dialog, enter your account details and that's it. Mailnag should now automatically start each time you log in (this can be disabled from the Mailnag Configuration). To use Mailnag with Gmail, in the new account configuration enter "imap.gmail.com" for the server, leave the "Port" field empty and check the "IMAP" box. In newer Mailnag versions, also make sure the “Enable SSL Encryption” box is checked under your account settings. For help with the Mailnag translations, bugs, etc., see Mailnag @ Github.